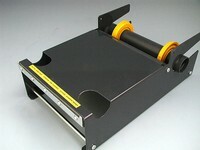 The Model LP-8 all steel heavy duty label protection and pouch tape dispenser is sized for tapes up to 8" wide. Mountable to any work surface, the LP-8 is easy to load and use. Platform design makes sure label is delivered flat. Accepts 3" core roll. Maximum tape roll diameter: 6".